I love birthdays. 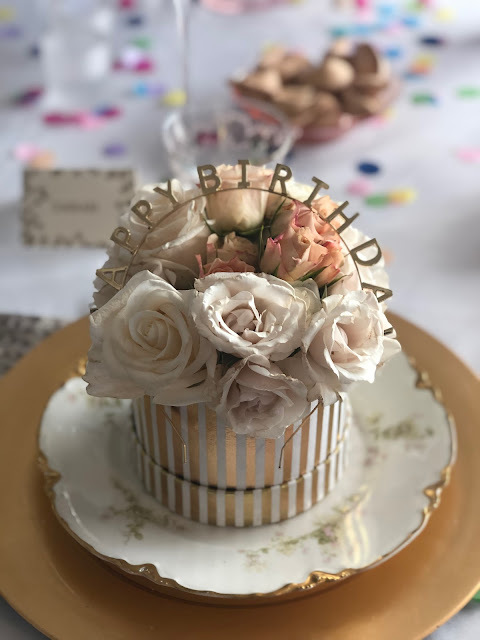 It doesn't matter how many trips around the sun it represents, a birthday is a joyous day that is meant to remind us how much we are loved, and birthdays are meant to be celebrated. And I love my sister in law, Sarah. She turned 50 a month ago and celebrated with her family at a getaway at one of their favorite spots at the beach. A milestone birthday deserves extra special attention, so I wanted to throw her a birthday dinner for the ladies in her life. As you can see from the photos of Sarah, she glows. She has earned her happiness in every way, through her selfless gifts in motherhood, in friendship and for her family. Sarah has put in the work that it takes to have a life well lived and I am grateful for the love she gives to my brother and their daughter, to me and my family. We are lucky people. So, it was time to celebrate this lady. She chose a small group of women that are special to her, including her daughter and mine, her friends and neighbors. We played 80s trivia during cocktail hour, we toasted with pink champagne and ate an Asian feast. And we had cake and laughed and celebrated. It was perfect in every way, just like Sarah. Here are the details on the party and the menu. 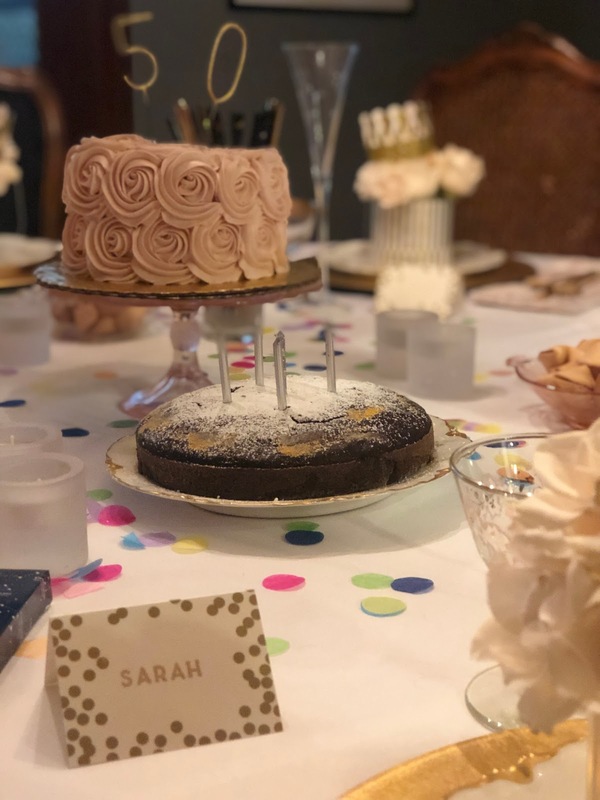 Find a way to celebrate in your own special way when the occasion arrives. Cheers! First, my daughter Gracie found this super cute "Happy Birthday" headband at Forever 21 for $5! Then we hit Paper Source for decorations. We bought miniature hat boxes to hold floral arrangements for each place setting. They are sold as gift boxes, and we couldn't get all the same pattern so we mixed two; the small Round Gold Stripe and the Gold and Blue Vine. We bought the larger size for Sarah since she was the birthday girl! 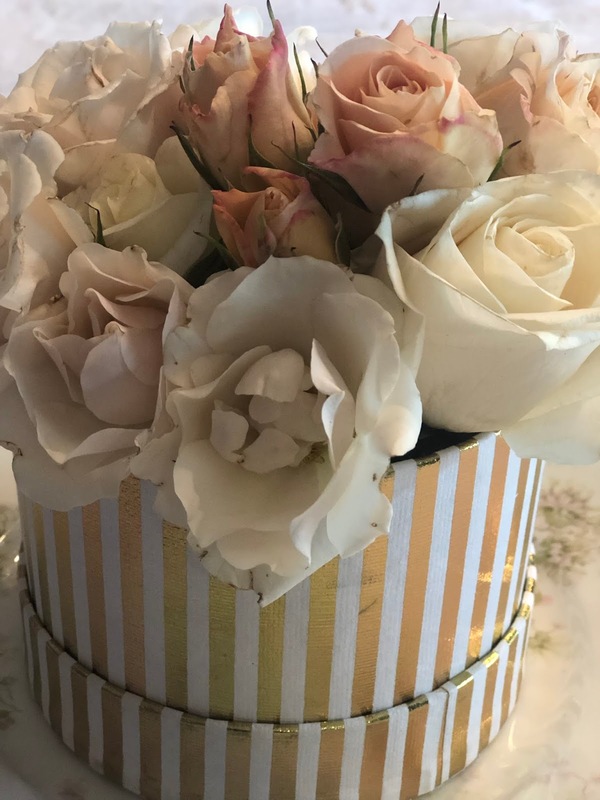 Three days before the party, I loaded up with a variety of white and cream roses from Trader Joes and put them in a bucket of water in my cool garage. The day before the party I used plain small glasses I already owned to hold the flowers and cut them short to make small arrangements. I placed the cups inside each hat box and put them on the place settings. 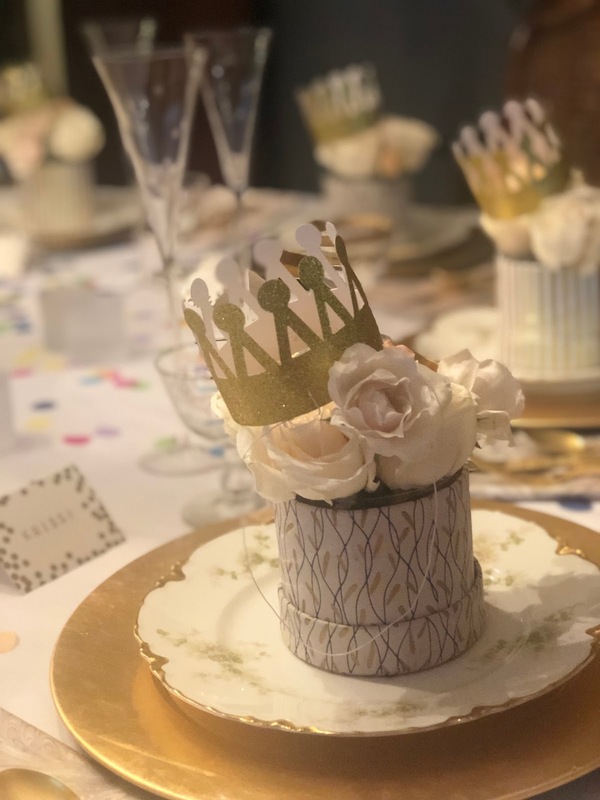 Mini Gold Party Crowns were placed on top of each floral arrangement for each guest to wear once we sat down to dinner. Because who doesn't love a crown? My daughter gave me an embossing kit for my birthday a couple of years ago, and basically created a monster. It is so satisfying, and so fun! I couldn't find my embossing pen to write the guest names on the place cards so I used this PEGZ lettering set to make custom cards. You just pop the letters together, stamp it in a clear ink stamp, dust the embossing powder (I used the aptly named "Princess Gold") and use the heat embosser to finish it. I love antique shops and I also love tabletop of all kinds. 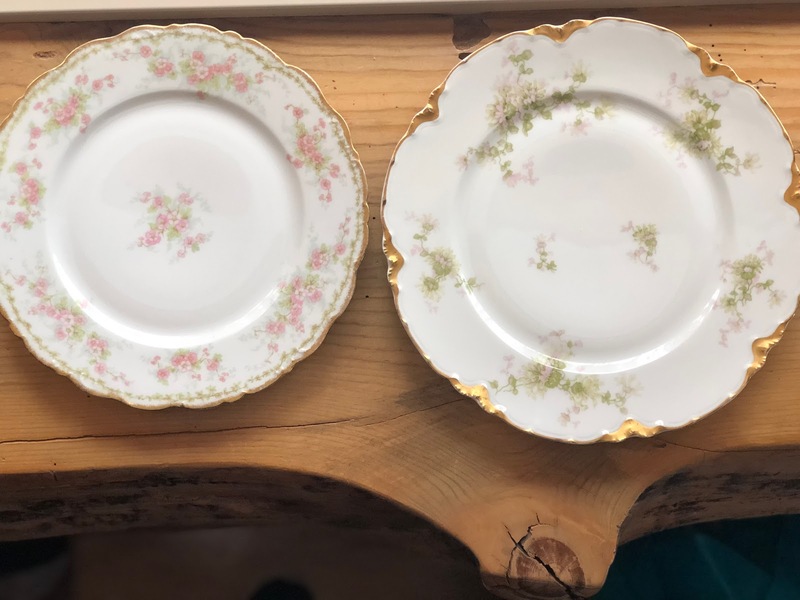 I discovered these beautiful Haviland & Co. French Limoges Ranson Gold and Floral Plates tucked into a corner of Robins Egg Bleu in Winthrop, Washington. I thought they would be so perfect for the party. They are pictured above on the right. I also found a set of Limoges lunch plates that I scooped up, pictured left. As is often the case with sets in antique shops, the set was not complete and there were only six. Lucky for me, I found three more on eBay that happened to be in Kent, Washington, and the kind seller rushed them to me just in time for the party. 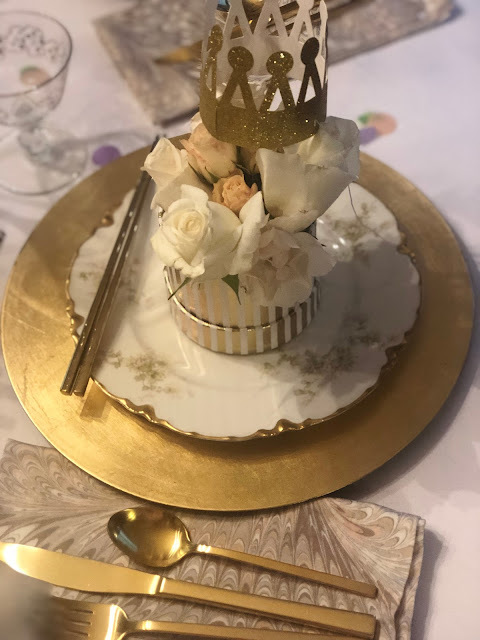 I placed each plate a gold charger to make it pop off the white table cloth. Since I was doing a gold theme, I used my west elm gold flatware. I love the sleek modern contrast with the traditional style of the plates. I cannot tell you how often I use this flatware set. It is so good and a great price point. Since we were having Asian food I added gold chopsticks. It is all in the details. 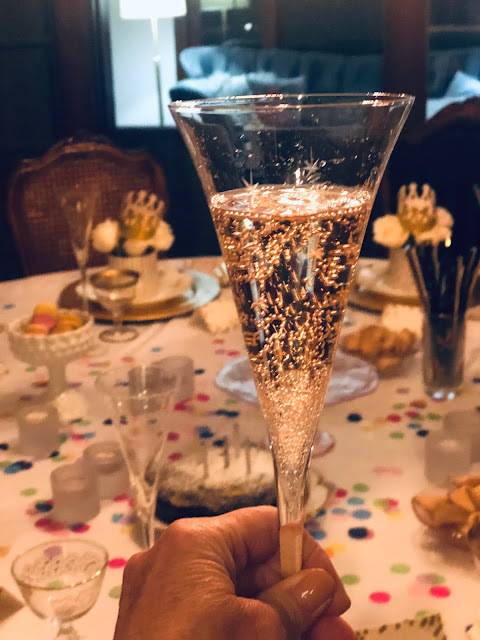 I used my gold-rimmed Coup Glasses from Williams-Sonoma and mixed them with antique champagne glasses and flutes for the table. Mixing glassware, plates and silverware is something that I often do when I set a table. If you set a simple landscape on a table then mixing patterns is a great way to make a modern table. Finally, we added simple white votives and scattered the Multi-Color Tissue Paper Confetti all over the table to give it a festive vibe. Sarah loves polka dots so this was the perfect last detail. And the cake. Although I love to bake, this cake is so beautiful and special that it is our go-to when we want to have a special cake. 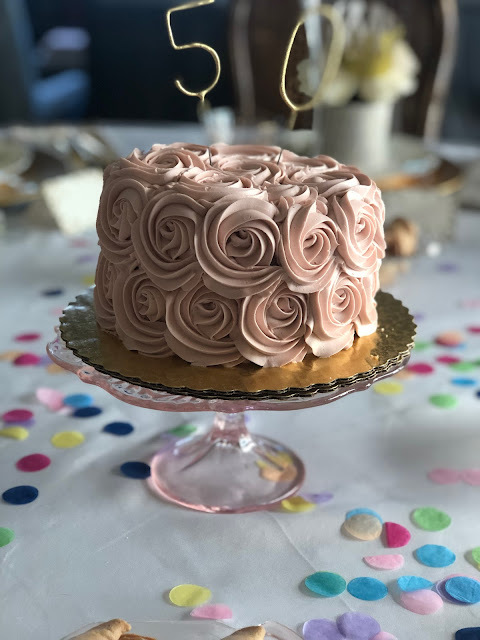 The champagne rose cake from Metropolitan Market has gorgeous buttertcream rose frosting in any color you prefer and is not just lovely but delicious. I topped it off with Sparkler Wand Candles that sparkle when lit! I did bake a gluten free cake dark chocolate cake for our guests that preferred it. In fact, the entire meal (minus the rose cake) was gluten free. 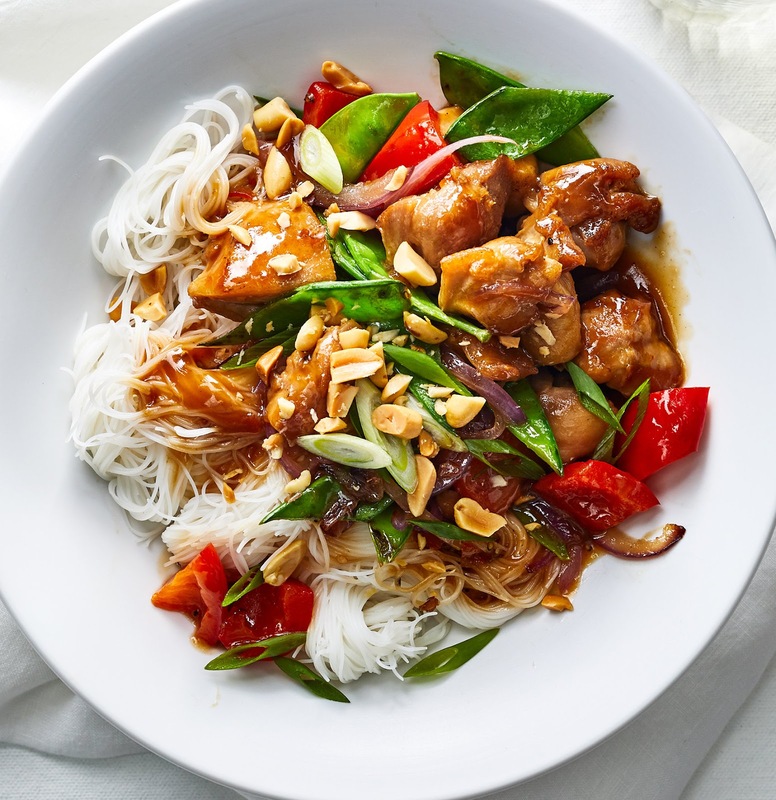 I saw the recipe for our main dish, Orange Chicken Stir-Fry with Rice Noodles, in Real Simple Magazine, tested it out and loved it! I made it with rice noodles but it would be great with sticky rice as well. Happy Birthday beautiful Sarah. I love you! I love Halloween. My Mom was big on holidays and as a former teacher she made our home full of fun and easy decorations. Decorating for the different holidays make ordinary days just a little less so, and it is a great way to create new looks for your home to reflect the seasons. 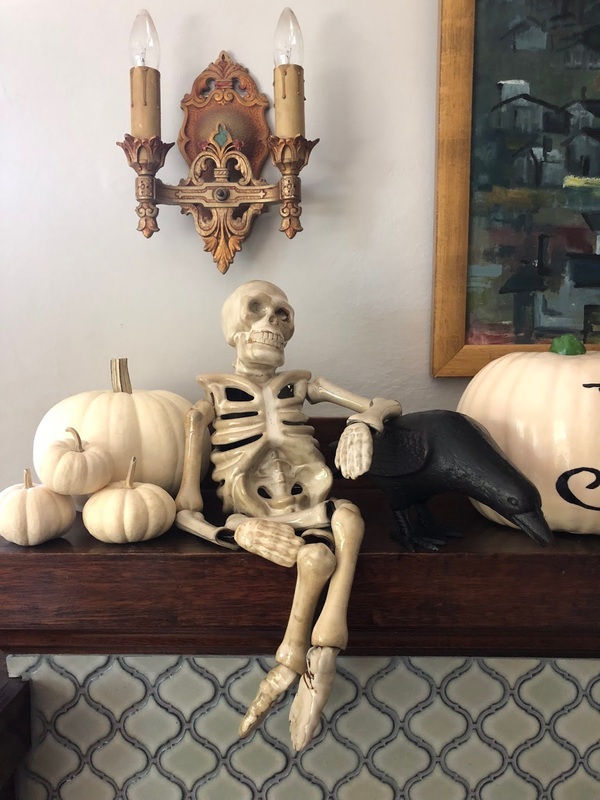 My children are now teenagers, which mean some of the more whimsical Halloween (but not all) has made way for more sophisticated spookiness. They still love all the decorations and I love making our home festive. 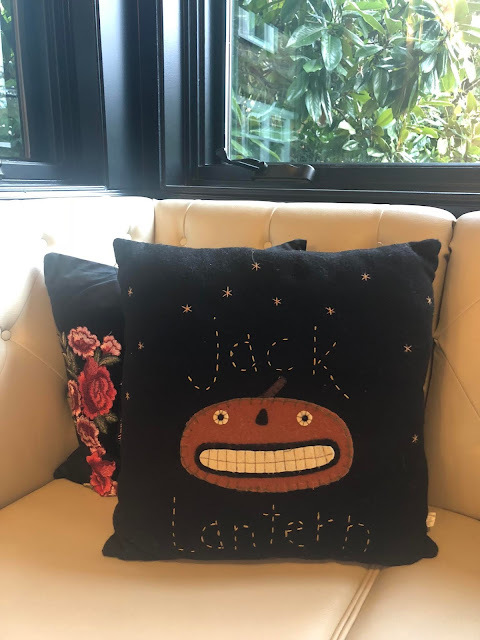 Each room has a bit of 'spirit" to it at Halloween. 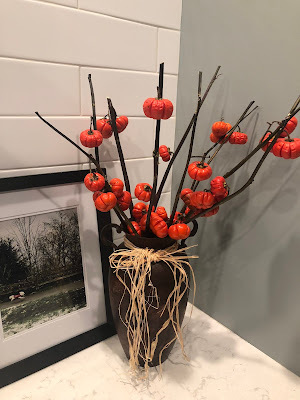 I found the ceramic luminary pumpkin shown above at Swanson's Nursery years ago but you can find similar decor everywhere, including this Pottery Barn one. This year I bought this vintage candlestick trio filled with harrisii black air plants at Queen Anne Frame and Gift and am dying over them! They are simple chic and and as a bonus I am certain I can't kill these plants. My friend Kirsty of The Kirsty Files and her husband Nick own this fabulous gem of a shop with a beautifully curates selection of gifts and the best frame shop in town. There are so many ways to make your home have a holiday feel without looking like the mall. One of the main things I love to do, besides my mantle, is my tableware. For years I have been sewing cloth napkins for every season and occasion, something my Mom also taught me. Since I have zero patience for long projects, picking beautiful fabrics and sewing napkins is a great way to be creative. I feel zen while doing these little projects and at the end I have something to show for it. We eat dinner as a family as often as we can, and I always set the weekday table with placemats, cloth napkins, a festive plate and pretty glassware. I don't believe in saving the good stuff, so we use all the pieces we own. If you have it, enjoy it, and you teach your children the value of making things beautiful as well as spending time together each day. I love plates and glassware and have collected enough to be somewhat of an organized hoarder at this point. This year I added these fabulous Crow by Victorian English Pottery plates to my collection. 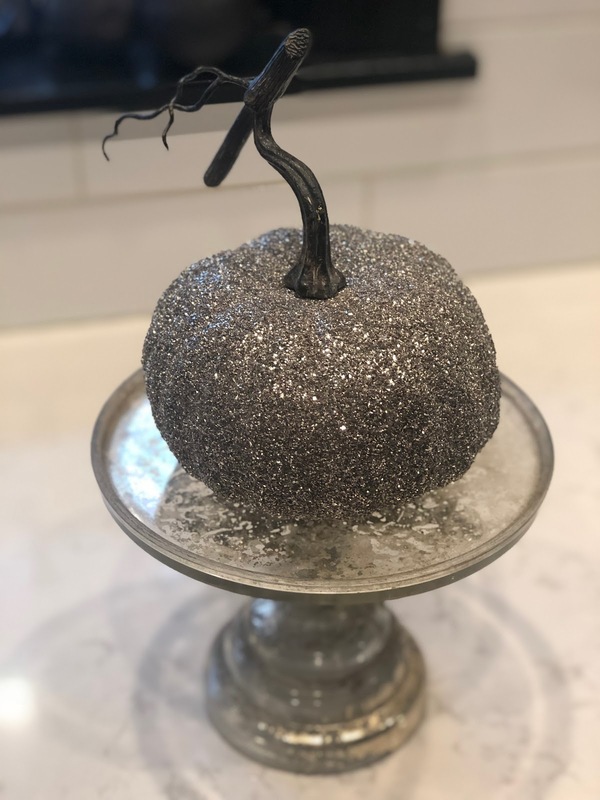 Of course they have a Halloween vibe, but they will be a sophisticated look to a black and white table any time of year. 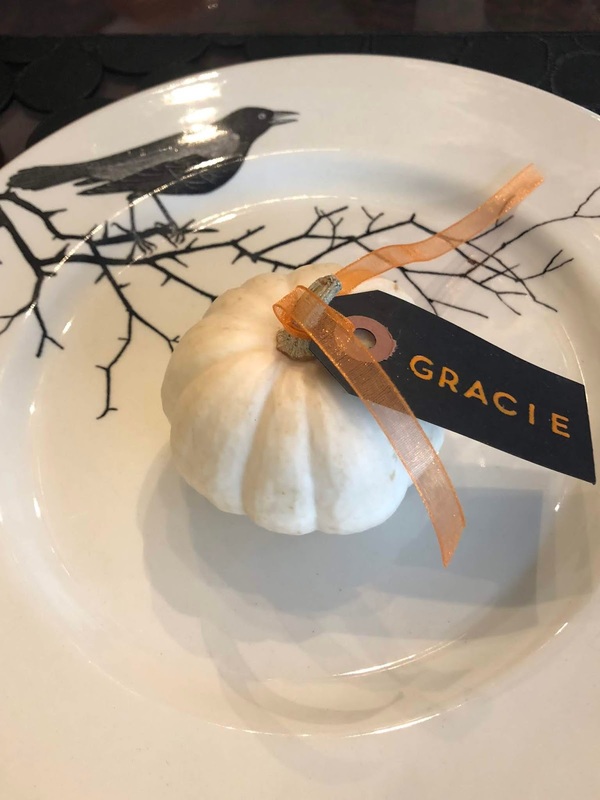 As an easy place card, I took a mini ghost pumpkin and tied on a tag I made with my embosser from Paper Source. If you haven't gotten into the embossing game, well, let's just say its addictive. My daughter Gracie gave me one for my birthday and it is fabulous fun. Make your entranceway to your home have a spooky vibe is easy, especially this time of year when the real spiders seem to be an ever present part of the "natural decor". I bought this cool black planter over the summer at Magnolia Garden Center and it looks like a heavy ceramic pot but it is light as a feather. 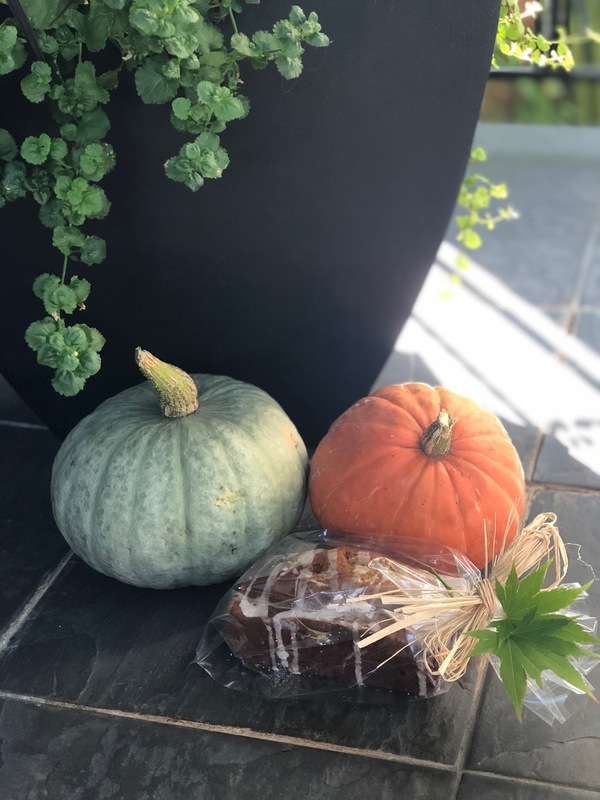 This month I replanted it with fall planting like black grasses and autumn perennials, then added some cool colored squash and a faux chalk pumpkin that I could write on. 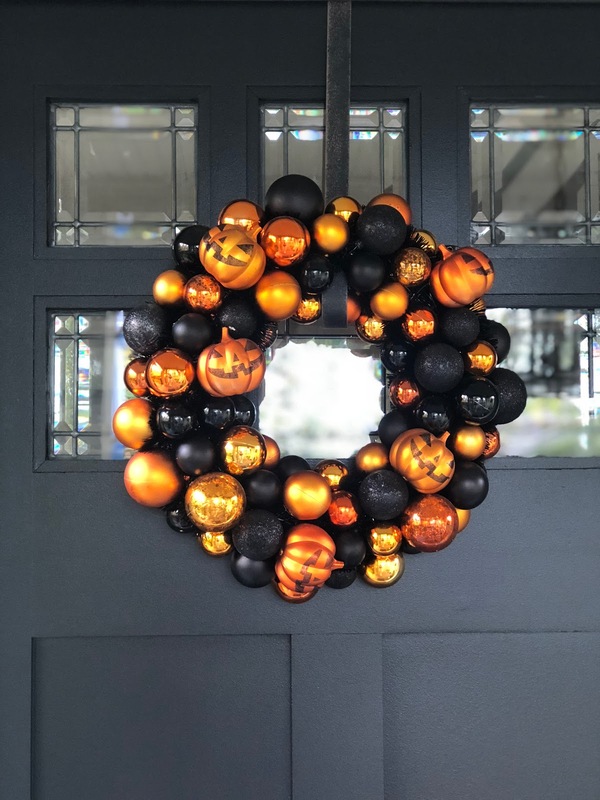 Our black front door is perfect place for a festive Halloween wreath. This one is from Target a couple of years ago and I am happy to report they make a new version of it. It is such a fun way to greet your guests, and it is shatterproof in case some ghoul slams the door! 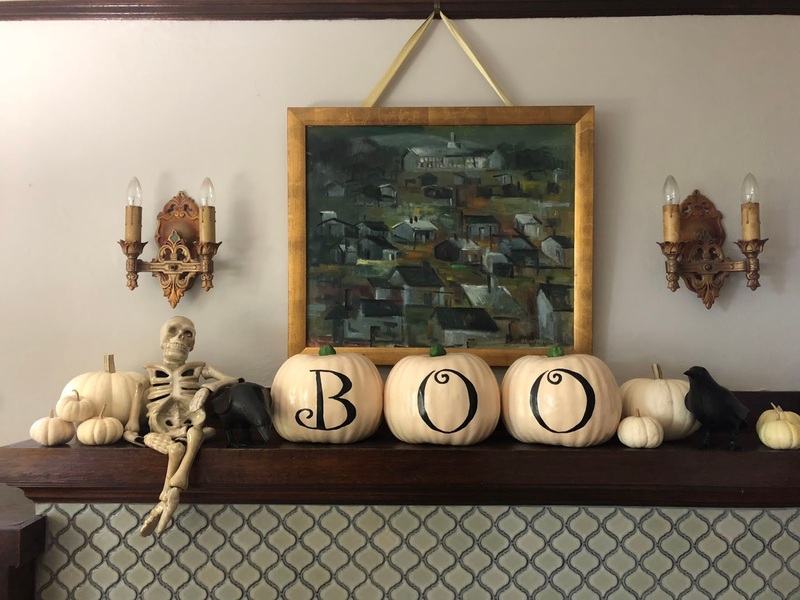 These cream foam pumpkins look good with the real thing on our mantel. Mix up the sizes, stack em up and add some creepy characters to make a statement. I don't like Halloween decor to be too creepy, but this guy is actually a luminary and he's easy to pose, so he's a good addition to our holiday mantel. I kept the color scheme here cream and black, but a pop of orange would be fabulous too. Don't forget the little spaces. 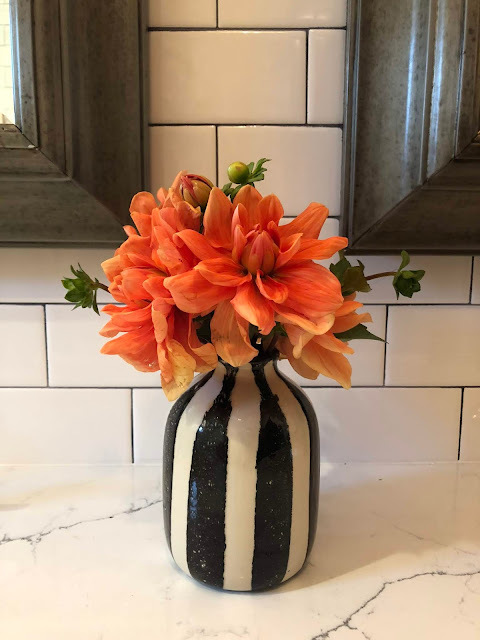 I found this vase in Paris at Maison Sarah Lavoine and it sits on our main floor bathroom countertop. I switch out the flowers to reflect the season, and orange dahlias seem to be the perfect fit for the mood. 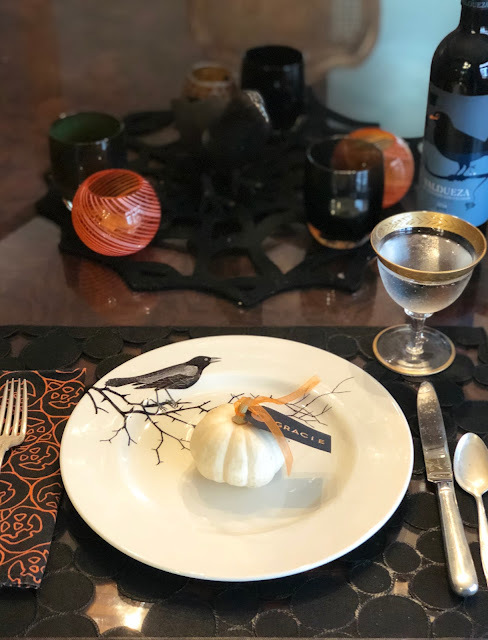 Mix some Halloween whimsey with a sophisticated palate. 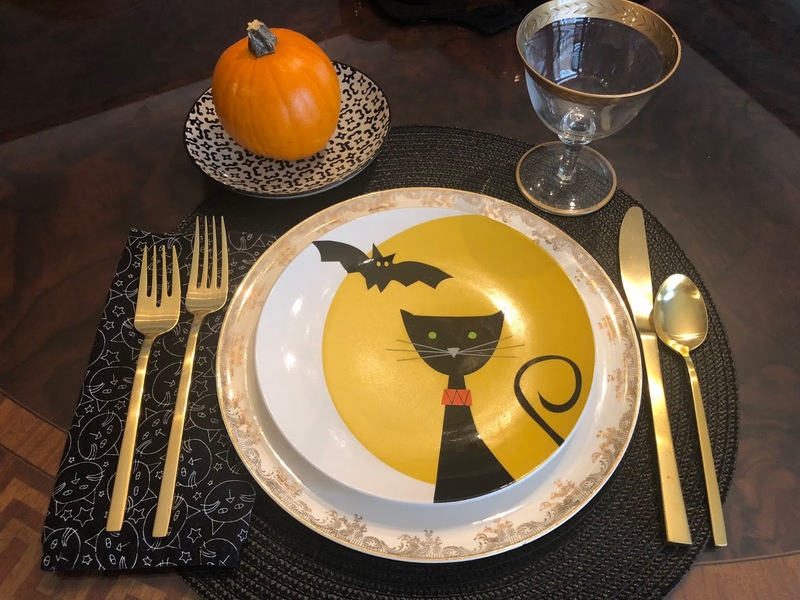 I added the Tag brand black cat plates over the top of my vintage China and used our West Elm gold flatware to keep things chic. Kitchy black cat napkins and gold rimmed glassware mix it up in a fun way. I love these Skeleton Trio plates from Wayfair too. The Day of The Dead decor is everywhere this year, including Trader Joes, where I found this little plant holder for under five bucks. 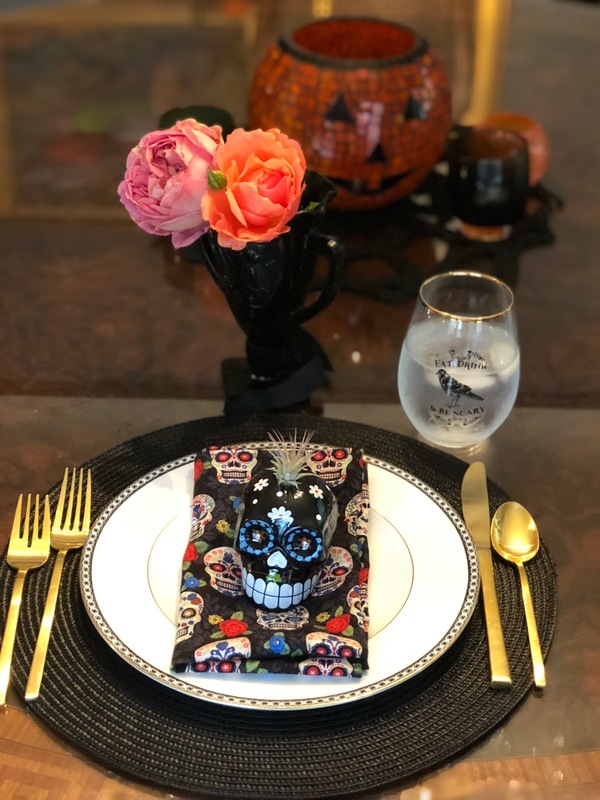 I sewed up some matching napkins with Sugar Skulls and Flowers fabric from Joann and included some festive "Eat, Drink & Be Scary" glasses from Fred Meyer. Underneath is my Wedgwood wedding china. I love mixing high and low. Pottery Barn has the coolest German glitter pumpkins in silver and gold as well as mercury glass and clear pumpkins. 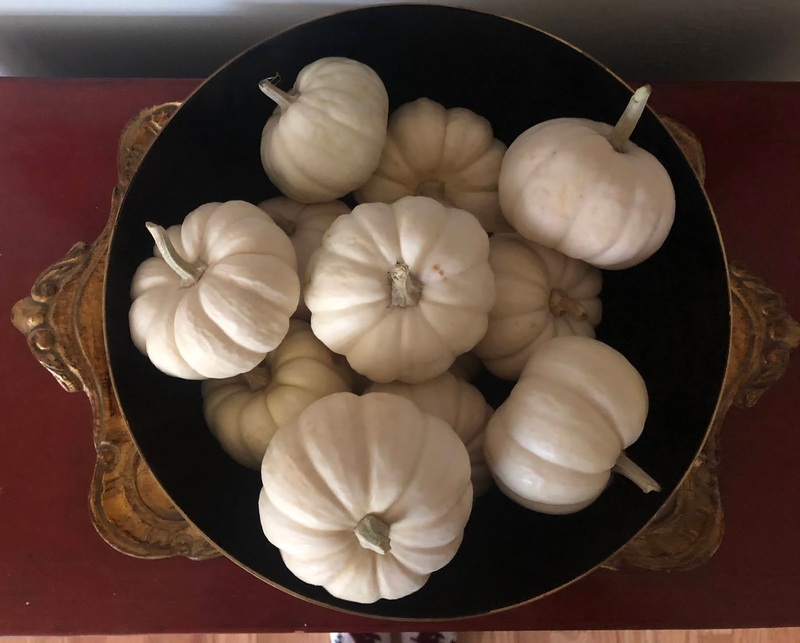 The great thing about these sophisticated squashes is they can be used for decor all fall long since they aren't Halloween specific. 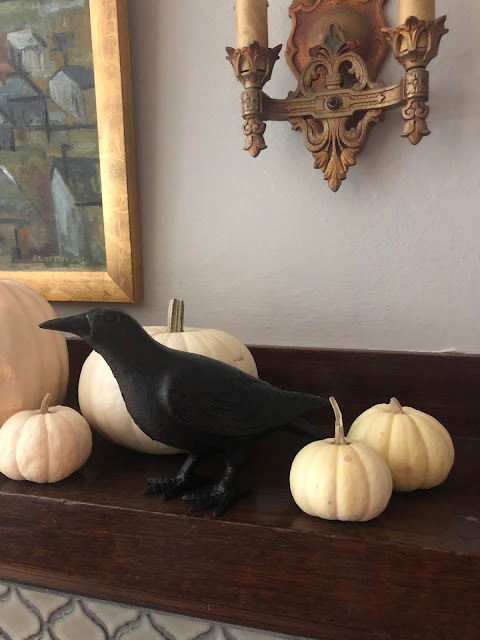 This beautiful gold and black lacquered bowl from Maison Luxe is the perfect piece to pile up a bunch of mini ghost pumpkins on my entryway table. The black interior would also be great with mini orange pumpkins. Three Birds Home on Queen Anne is one of my go-to spots for gifts and decor. These iron crows are so cool I may just keep them tucked in our built in bookshelves all year round! The bar car is another place to add some spooky spirits. 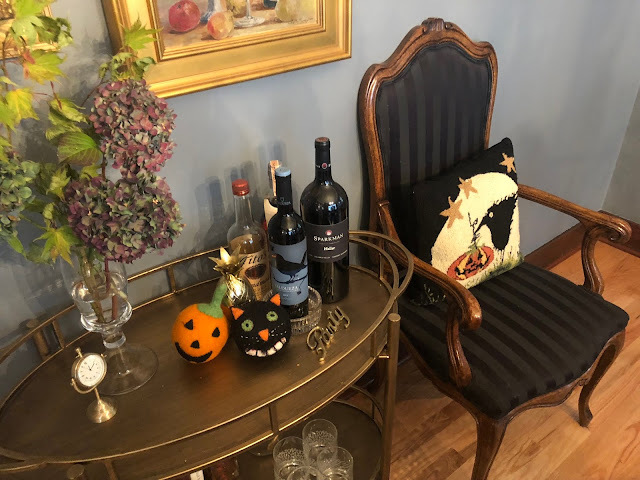 I like to look for Halloween-like wine labels, like Secret Squirrel and this Valdueza El Canto De Los Pajaros Spanish red I found at Queen Anne's Ken's Market. Ornamental Eggplant Pumpkins On A Stick can be found at all the grocery stores right now through November. They are a pretty and easy way to add fall color to your floral arrangements and are great on their own! I found these at my local Trader Joes. Spooky pillows add some fun to an sofa or siting space. These baked Mini Pumpkins are from the original The Barefoot Contessa Cookbook. I hollowed them out, filled them with homemade chunky applesauce, and baked them for an hour at 350 degrees. 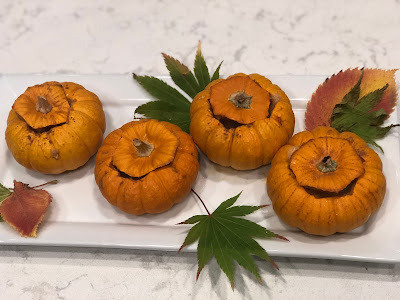 The house smelled delicious and they are such a great bite of fall. Summer’s over; now it’s fall, just the nicest time of all. – Lois Lenski. One of the first cookbooks I bought when I was learning to cook was Best of Friends Cookbook by Darlene Glantz Skees, published in 1987. Since my Mom taught me to bake at an early age, I always used to turn to the baking section to get my confidence up before trying other kinds of cooking. The author was from my hometown of Billings, Montana and went on to write several incredibly popular books in her lifetime, before passing away from an illness in 1998. It was a side gig for Skees, who was a nurse by profession and her recipes were both user friendly and creative. Cookbooks are often time capsules of sorts for the era they are written in, yet some hold up no matter what the decade is. The Pumpkin-Chip Bread recipe is one of those. 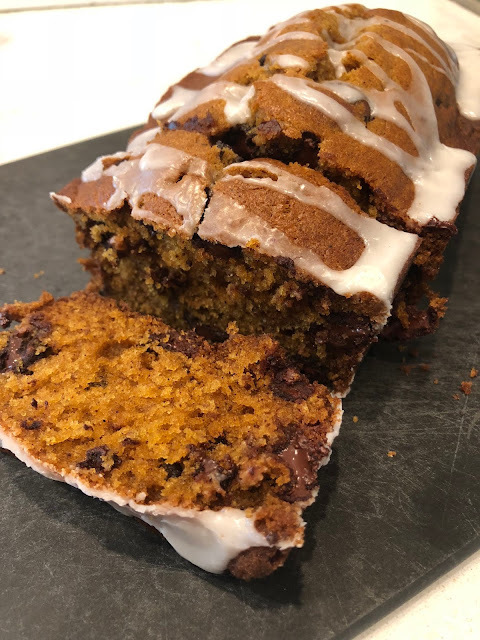 I consider myself an accomplished home cook at this point, but whether you are new in the kitchen or an old hand at things, this is a fall recipe to put on repeat. I always double this recipe and then bake several loaves for my own family and for gifts to give away. I love the Honey-Can-Do paper loaf pans that come in a variety of sizes. It is a pretty way to bake up a treat without having to worry about having enough pans to bake a big batch of bread loaves. 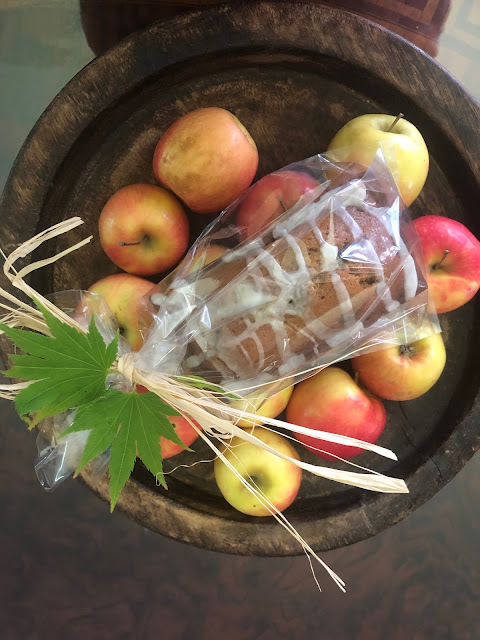 I keep clear cellophane bags on hand to wrap the loaf in after it has cooled to keep it fresh, then tie a bit of raffia ribbon around a small autumn leaf and drop them off on porches of my neighbors and friends. Include the recipe if you like to share the love! Preheat oven to 350 degrees. Grease and flour two 9x5x2 loaf pans. Sprinkle 1/4 cup of the nuts. Cream together butter and sugar in a stand mixer or hand mixer. Blend in the eggs one at a time. Combine dry ingredients, then alternately add the pumpkin, then the dry ingredients mix until it is combined with the butter and sugar. Fold the chocolate chips and 1/2 cup of the nuts, if you are using them, in by hand. Spoon into prepared loaf pans. Bake for 45-50 minutes, testing for doneness in the middle with a toothpick. Meanwhile make the glaze. Remove loafs from oven and cool for 5 minutes on a wire rack. Remove the bread from pans and return to the rack, then drizzle with glaze. I put a piece of parchment underneath the rack to catch the dripping glaze. Note: The original recipe says it is best to hold them overnight to let the spices set, but we like to eat it warm from the oven. It can also freezes well, although we never have leftovers! Although I have always loved fashion, years ago, before Instagram and blogging even existed, I ran cooking schools. I had my own business, Culinary Concepts, where I implemented and ran cooking school programs for businesses related to the culinary world, including retailer Pasta & Co., a bookstore and a kitchen shop. I hired chefs from local restaurants, wrote the curriculum and worked alongside some of the best culinary talent in the Puget Sound, including Tom Douglas, Jerry Traunfeld, John Sundstrom, Linda Augustine, Karen Binkhorst, and so many more. Once, when the International Association of Culinary Professionals held their conference in Seattle, I worked with and in Pike Place Market to create all the floral arrangements for the opening evening for the conference. I worked with a local grower to force bulbs and stood in a stall watching all the comings and goings of the market for a full 14 hours. People traded flowers for food, buskers came and went in a perfectly orchestrated scene that was like being in the center of a movie. I couldn't feel my hands from the cold and work by the end of the day but seeing my flower arrangements sprinkled throughout the venue was really something. It was an amazing time in the Seattle food scene and I loved being part of it, but by 2003 my husband and I were parents to two children under three years old, and so I hung up my apron. 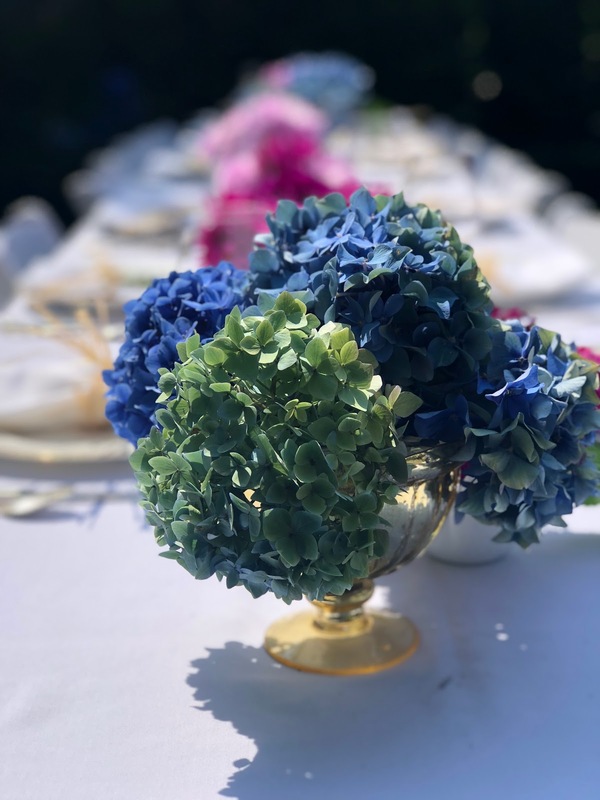 My husband and I throw a garden cocktail party nearly every year, however this year we decided to do something more intimate and have a dinner party instead. 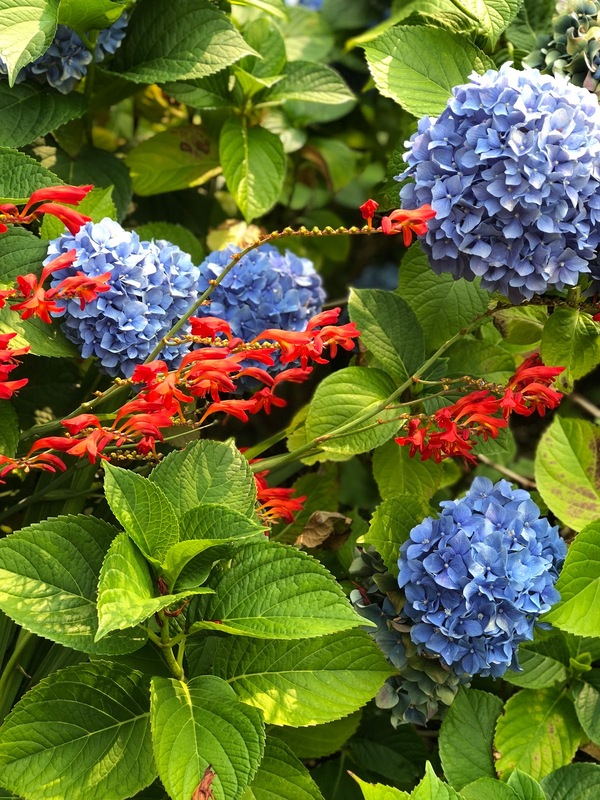 While my established garden is far from perfect, it is full of huge hydrangea bushes, roses, lavender and grasses, and I wanted to have a soiree before our gorgeous summer weather turns to crips fall. That being said, we did invest in a couple of heat lamps.....which were awesome when the sun set. I always use Paperless Post for my invites, since I love their designs and their tracking system. The key to a great party? Mix up the guest list, organize your menu with a daily to do list, and do as much ahead of time as you can so you can enjoy your own party. My menu was written out on our kitchen chalkboard for our guests by my daughter Gracie. The menu included recipes from Ina Garten's Barefoot Contessa Cookbooks, Pasta & Co. By Request, and a couple of my own interpretations. Here is my to do list prior to the party and the day of the event. I own white linen napkins in bulk (2 dozen) that I dry clean and have party ready. 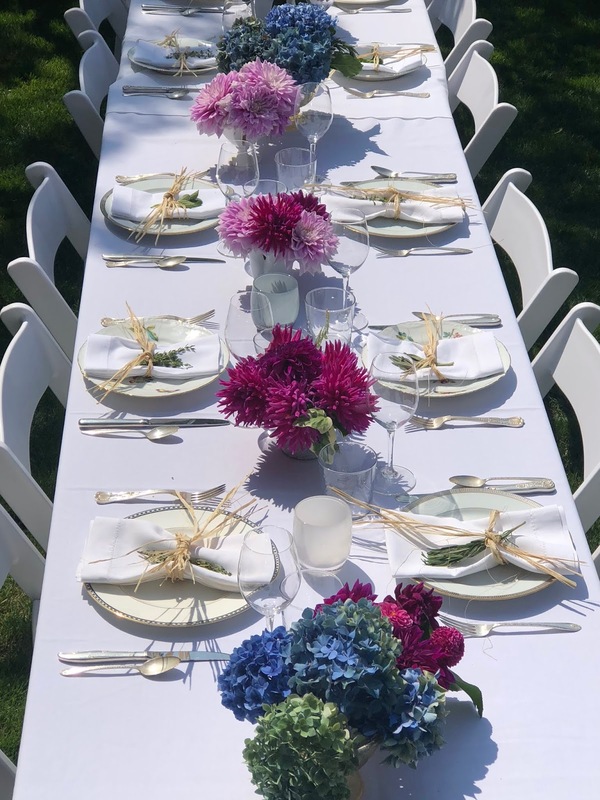 We had last minute guest additions for a total of 15, so I ordered two 8 foot tables and floor length linens plus extra white padded chairs from a rental company. Order any rentals for pickup the morning of your event. Make your party playlist! Music is key to set the mood for the event. One of the perks of being the host is you get to play your music. I based my list on Gwyneth Paltrow's goop Outdoor Dinner Party playlist for Spotify, then added my own groovy tunes. I like a mix of everything from Lenny Kravitz to Valerie June, The Cure, Fleetwood Mac and Brooks & Dunn. Mix it up I say! Figure out your menu, then write a coordinating shopping and prep list. Lists are key to staying organized. I write down a list of what to do each day, five days prior to the event and going forward. Finalize your decor theme. There are lots of ways to do a garden theme dinner party, and I chose to go with outdoor elegance. I mixed my own china pattern with two other patterns borrowed from friends, including a vintage botanical butterfly pattern. I also own a mix of many styles of vintage sterling silver flatware that we use as our everyday silverware. 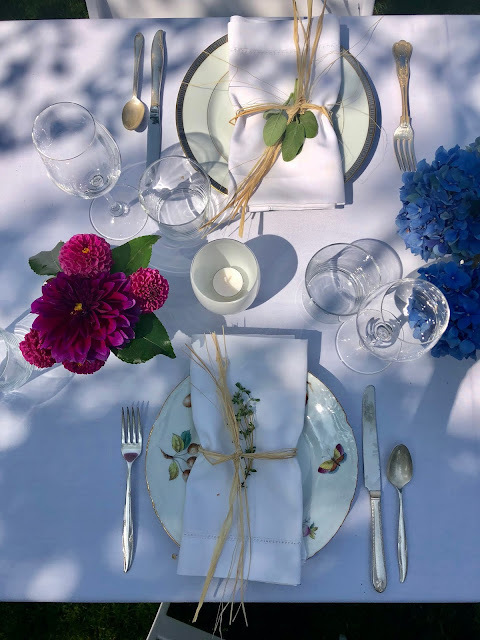 I mixed the plates and flatware across the table, keeping the glassware the same, although having different wine glasses would be fabulous too. I like the linens all white so I can be creative with the table settings. I tied a spring of a fresh herb with rafia ribbon to each folded dinner napkin. Drinks. We did lots of pink bubbles, still róse, crips French whites, plus beer and vodka/gin/bourbon. Also, tons of sparkling waters and lemonade to keep everyone hydrated in the warm summer evening. Last time I filled up a big metal wheelbarrow, but since we had a bar table I filled copper beverage containers up with ice and bottles. Flowers are key to the theme. 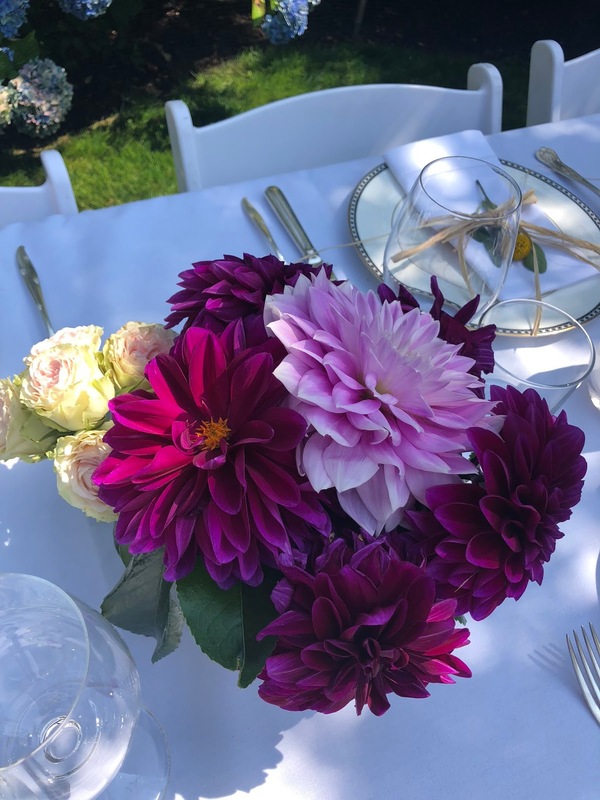 Most of mine were cut from my garden, and lucky for me I have a friend who owns a flower farm and she gave me a huge container of mixed dahlias. This time of year the farmers markets are a great place to get an armload of gorgeous blooms, and I also hit Trader Joes since they often carry seasonal blooms and great greens. I used a combination of different size (but low) vases and glasses to hold the blooms. I made the arrangements two days ahead and kept them hydrated and in a cool spot. Lighting. We strung lights across part of our yard earlier in the summer so it was the perfect place to set a table underneath. Lighting is so key. I added votives, including small citronella candles, plus Glassybabys all down the table since I think the more candlelight the better. 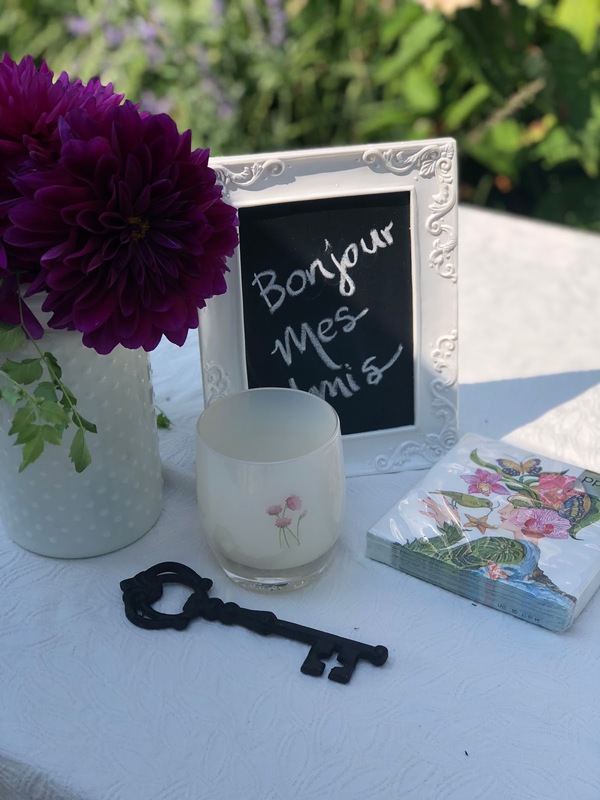 The summery Glassybaby "Posie" was perfect for the bar table, along with flowers and a small chalkboard frame from Target. We hired our daughter Gracie and a friend to serve drinks for guests and help with plates and dessert. It was an incredible help to have extra hands to whisk plates away and run the dishwasher so the kitchen wasn't a disaster. The menu. I like to make the hors d'oeuvres light and easy, not too filling or time consuming. I love Ina Garten's Make It Ahead cookbook, where I did an elegant and easy Roasted Figs and Proscuitto for the warm appetizer. 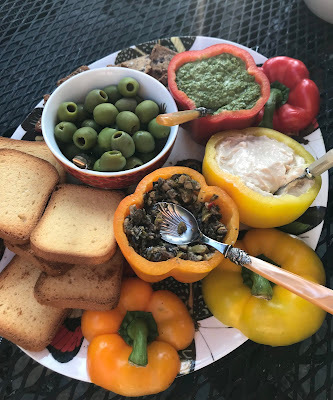 I love that the French always keep it simple with their drinks and snacks, so I did small bowls of popcorn, rosemary almonds and a few dips tucked inside hollowed out peppers. Enough to keep the hunger at bay without filling up your guests. The main dish, Asian Grilled Salmon was grilled by my husband a couple hours prior to the party then served at room temperature. This saved him from standing at a hot grill though the entire cocktail hour and it was easy for us to serve dinner when the time came. I made everything ahead of time, dressed the salads last minute and we were ready! The Trim-Berry Crumbles cooked in the oven during dinner and they were off the hook, served warm with ice cream. 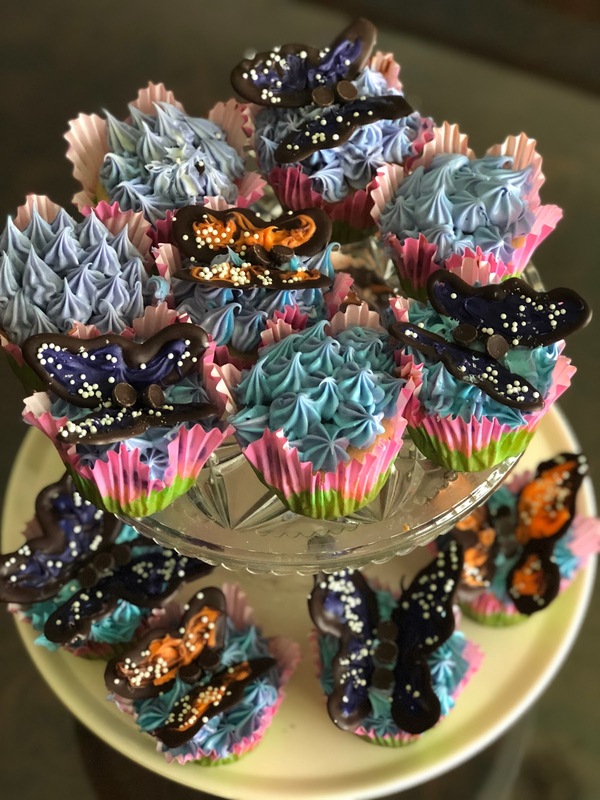 I sent the Monarch Cupcakes home with guests when they left. Thank you so much to Kirsty of The Kirsty Files, who captured many of these amazing photos while I was busy being a hostess. We are so fortunate to have such amazing friends! This has to have been now of my most favorite parties we have ever given. 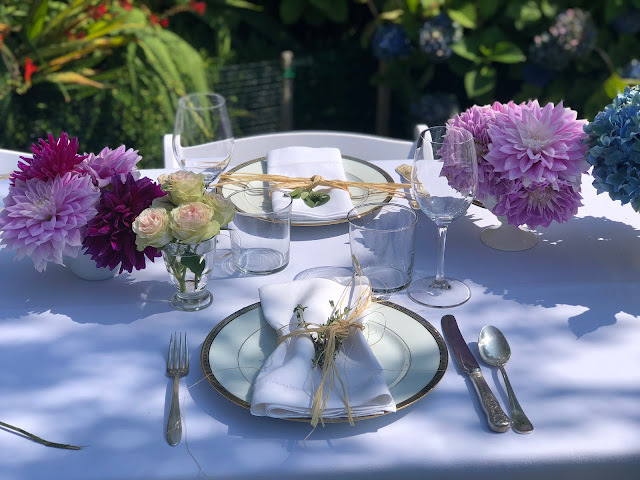 I loved the easy elegant vibe, the dining al fresco, the lovely guests. After all this time of entertaining I have finally realized that people don't care if your lawn isn't perfect or if your plates are mismatched....they just want to celebrate, to be invited, to enjoy your company. Having a impromptu party or a well planned out dinner gives you the same result...happiness. I love things to look perfect, to taste and feel perfect, but they nearly never are. That being said, I come from the school of "Camp Good Enough" as my friend Stephanie and I often called it. This is where you work your hardest and it turns out how it turns out, and you are ok with that. Would I love to have it all be Instagram worthy? No, that sounds exhausting. Still, I do often try, and knowing that I can accomplish things that make me and my people happy is really what matters. Sometimes I hit the mark and often I don't. But it is fun trying. 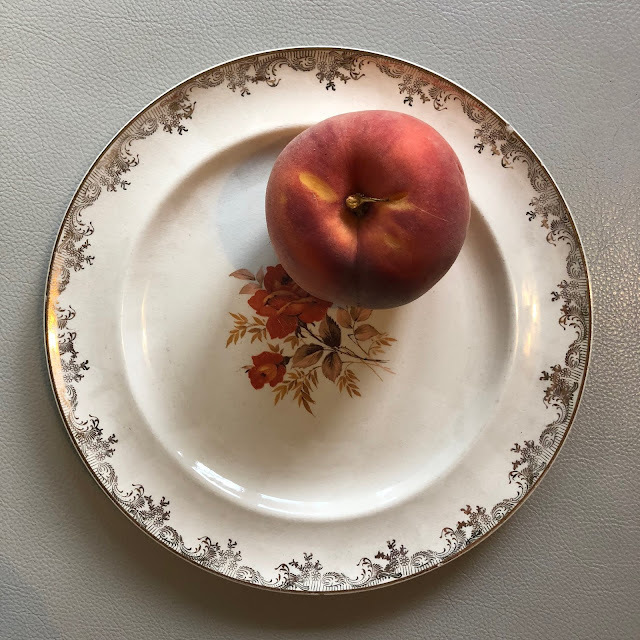 I could say that I wandered with my wicker basket through our local farmers market (which I often do) and gathered peaches for a beautiful pie, but this story is a much more practical one. My friend Kacy left me a couple of beautiful peaches after a picnic dinner on Friday, and when I peeked into my freezer Saturday I spotted two bags of frozen peaches I had tucked away. I grabbed them to thaw out while I did yard work, and during the afternoon I went to work on making a pie. There is nothing better than the smell of a pie in the oven and it was the perfect treat after a long day of garden work. Luckily I had also doubled a pie recipe and had a frozen disk perfect for a two crust pie. Normally I have my Mom's recipe for crusts in my freezer, but I had made these extra crusts from another recipe and that is what I had on hand. I had a difficult time with the new crust recipe, but chalked it up to operator error. Let me just say that I know baking well. I have made a million pies with from scratch crust in my life, so it took me by surprise that I could not get this crust to cooperate. I know all the tricks: don't over handle the dough, chill slightly, fold over to transfer to the pie plate, etc. but the crust just kept coming apart every time I tried to move it to the pie plate. Finally, I did the play dough technique (I made that up) were I got it as best I could to the pan and patched it together by hand. Funny looking mix, fabulous taste! 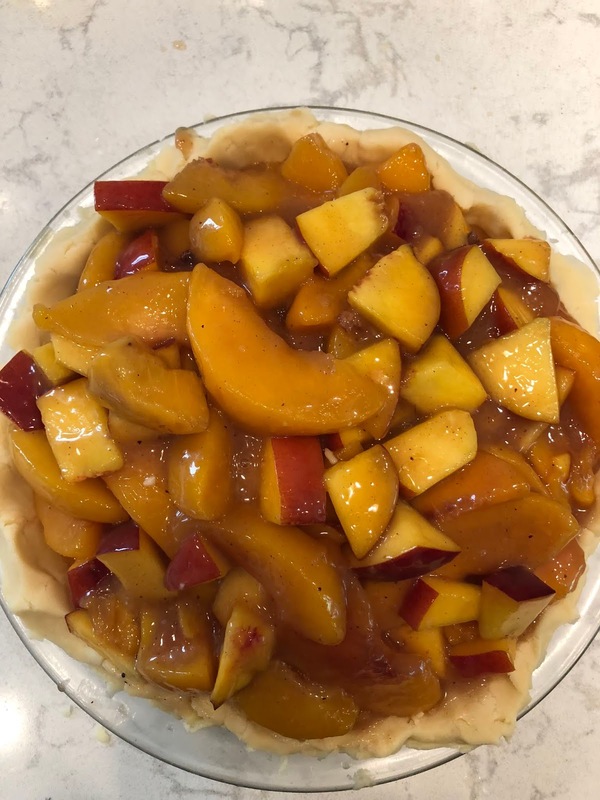 Nevertheless, I mixed my now thawed frozen peaches with my fresh cut up slices and followed the directions for the Peach Pie Recipe from Taste of Home. I had never made the pie before and loved the technique of cooking the juices as a thickener for the filling. I try recipes constantly, often for dinner parties, which is risky business indeed. I like challenging myself that way. The end result? 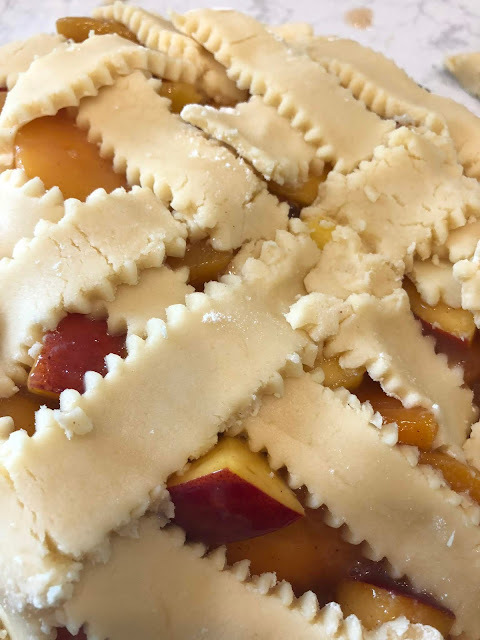 The rascally crust was fabulous tasting, and the mixed fresh and frozen peaches worked divinely--it was hard to resist eating just one slice! Sometimes looks can be deceiving and I was ok with it's "character". 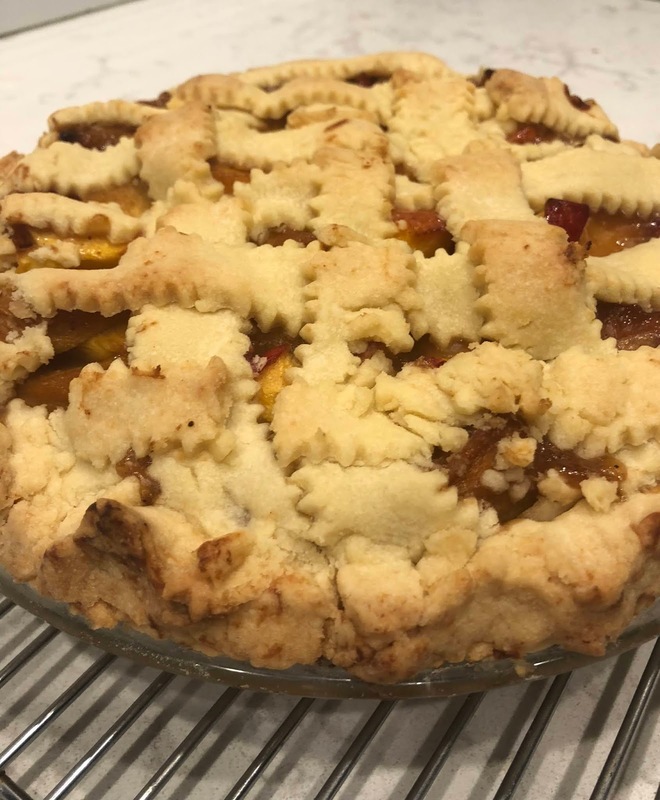 It was a perfectly imperfect peach pie and it was delicious. 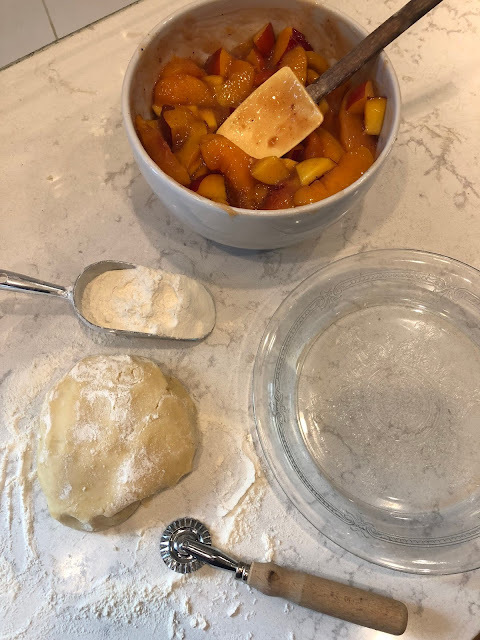 I will continue to test new recipes for both crust and pie, but my Mom's tried and true pie dough will remain in my freezer. I am sharing it below, and interestingly enough, Mom called it "Perfect Easy Pie Crust". 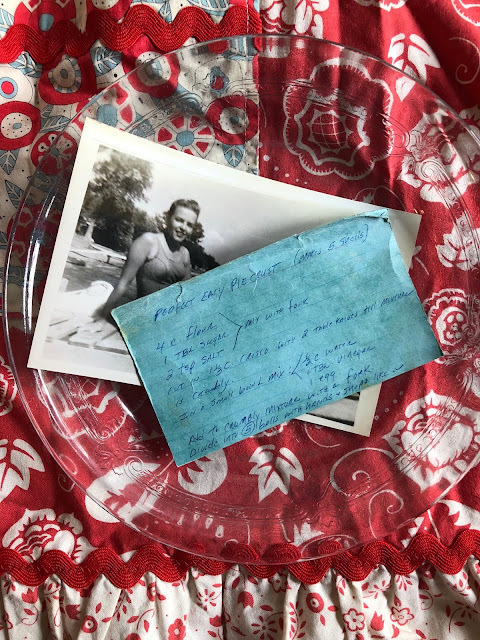 Every time I use her handwritten recipe cards, which is often, I can feel her near me again, and it is a perfect way to honor her memory. Mix the flour, sugar and salt together with a fork. Cut the Crisco into the flour mixture with two knives until it is crumbly in texture. In a separate small bowl, combine the water, vinegar and egg. Add it to the crumbled mixture and stir with a fork until combined. Note: I have made this recipe in both my Cuisinart and my Kitchen Aid Stand Mixer. Divide the dough into five balls and flatten into discs and wrap tightly in plastic wrap. Can be kept in the refrigerator up to one week or frozen. To bake a shell, roll out and put into a pie pan. I fold it into half, then quarters, set it in the pan and unfold it. Prick with fork and bake at 450 for 12-15 minutes. With August in full swing, the lavender in my garden has peaked and is getting a second wind. I am careful to trim it back to get new blooms to come. In June we had the pleasure of spending a week in Provence, France, where the lavender fields were abundant. Some of the larger fields had a low hum to them as thousands of bees enjoyed the season along with us. The sounds and smells of fields in Provence is truly a beautiful thing. Back home, I decided to make a simple shortbread cookie for a friend's birthday boating party and also whipped up an easy, no-machine-required lavender ice cream to serve alongside the cookie and a brownie. I used Martha Stewart's Basic Shortbread Recipe, adding two tablespoons of dried lavender I picked and pulled apart from a lavender cuttings from my garden. (Note: we do not spray our garden plants with any pesticides or chemicals). Martha's recipe calls for the dough to be added to a springform pan to bake but I rolled it out and cut shapes with my Mother's tin biscuit cutter from a collection of vintage cookie cutters I own. The slight ridged edges give it a French flair that is perfect for showcasing the simple lavender cookie. 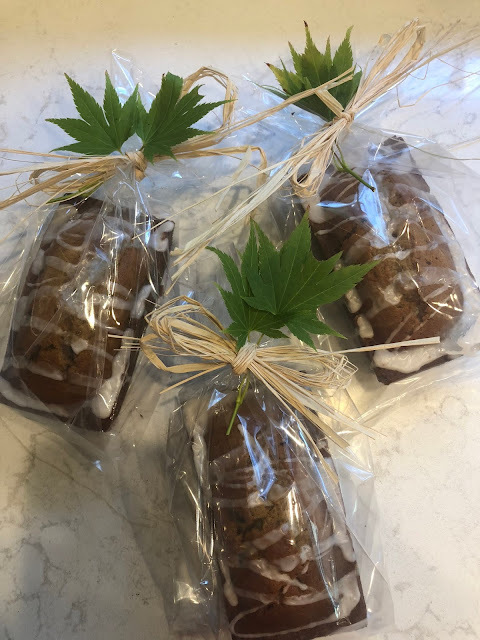 I doubled the recipe and made small gift bags of half dozen cookies tied with silk grey ribbon and fresh lavender to give as gifts at the birthday celebration. 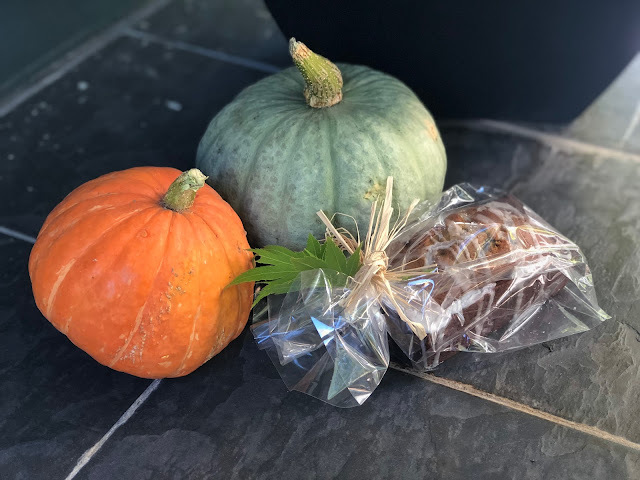 I made extra gift bags and brought them to friends in the neighborhood the next day....otherwise I was going to eat the rest! They are so so good, and so easy to make! This is not my backyard. But it is Provence and I was there to enjoy it all! Love this can't wait to try both!